I’ve just had my second journal paper published, and so I thought I’d start a series on my blog where I explain some of the background behind my publications, explain the implications/applications that my work has, and also provide a brief layman’s summary for non-experts who may be interested in my work. Hopefully this will a long-running series, with at least one post for each of my published papers – if I forget to do this in the future then please remind me! Wilson, R. T., Milton, E. J., & Nield, J. M. (2014). 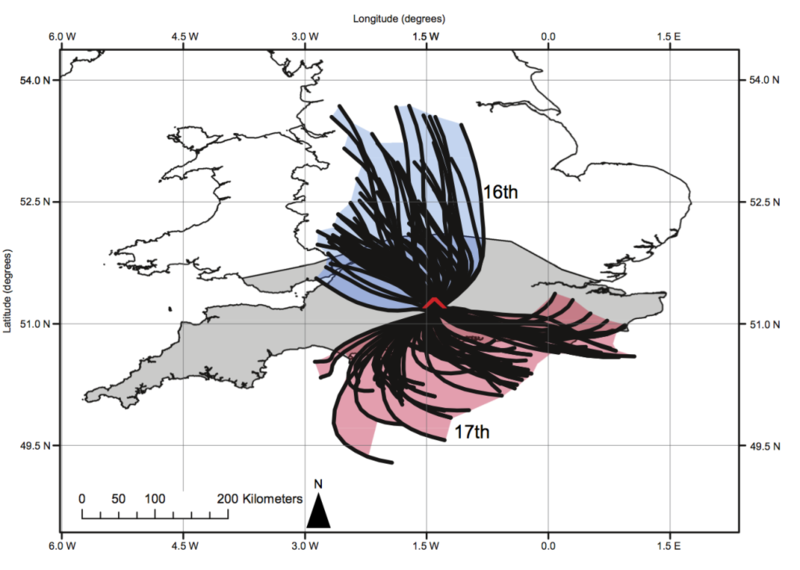 Spatial variability of the atmosphere over southern England, and its effect on scene-based atmospheric corrections. International Journal of Remote Sensing, 35(13), 5198-5218. Satellite images are affected by the atmospheric conditions at the time the image was taken. These atmospheric effects need to be removed from satellite images through a process known as ‘atmospheric correction’. Many atmospheric correction methods assume that the atmospheric conditions are the same across the image, and thus correct the whole image in the same way. This paper investigates how much atmospheric conditions do actually vary across southern England, and tries to understand the effects of ignoring this and performing one of these uniform (or ‘scene-based’) atmospheric corrections. The results show that the key parameter is the Aerosol Optical Thickness (AOT) – a measure of the haziness of the atmosphere caused by particles floating in the air – and that it varies a lot over relatively small distances, even under clear skies. Ignoring the variation in this can lead to significant errors in the resulting satellite image data, which can then be carried through to produce errors in other products produced from the satellite images (such as maps of plant health, land cover and so on). The paper ends with a recommendation that, where possible, spatially-variable atmospheric correction should always be used, and that research effort should be devoted to developing new methods to produce high-resolution AOT datasets, which can then be used to perform these corrections. Wherever possible, use a spatially-variable (per-pixel) atmospheric correction – particularly if your image covers a large area. Effort should be put into developing methods to retrieve high-resolution AOT from satellite images, as this data is needed to allow per-pixel corrections to be carried out. Relatively low errors in AOT can cause significant errors in atmospheric correction, and thus errors in resulting products such as NDVI. These errors may result from carrying out a uniform atmospheric correction when the atmosphere was spatially-variable, but they could just be due to errors in the AOT measurements themselves. Many people still seem to think that the NDVI isn’t affected by the atmosphere, but that is wrong: you must perform atmospheric correction before calculating NDVI, and errors in atmospheric correction can cause significant errors in NDVI. When I started my PhD I tried to find a paper like this one – and I couldn’t find one. I could find all sorts of comments in the literature – and in informal conversations with academics – that said that per-pixel atmospheric corrections were far better than scene-based corrections, but no-one seemed to have actually investigated the errors involved. So, I decided to investigate this myself as a sort of ‘Pilot Study’ for my PhD. This paper is basically a re-working of this Pilot Study. Once I got started on this work I realised why no-one had done it! The first thing I needed to do was to use data on Aerosol Optical Thickness (AOT) and Precipitable Water Vapour (PWC) to find out how much spatial variation there is in these parameters. Unfortunately, the data is generally very low resolution, and so it is difficult to get a fair sense of how these parameters vary. In fact, almost half of the paper is taken up with describing the datasets that I’ve used, doing some validation on them, and then explaining how I used these datasets to estimate the range of values found over southern England during the dates in question. The datasets didn’t always agree particularly well, but we managed to establish approximate ranges of the values over the days in question. Both of the days in question were relatively clear summer days, and I was surprised about the range of AOT and PWC values that we found. They were definitely nothing like uniform! Once we’d established the range of AOT and PWC values, we performed simulations to establish the difference between a uniform atmospheric correction and a spatially-variable atmospheric correction. These simulations were carried out using Py6S: my Python interface to the 6S radiative transfer model. This made it very easy to perform multiple simulations at a range of wavelengths and with varying AOT and PWC values, and then process the data to produce useful results. When performing a uniform atmospheric correction, a single AOT (or PWC) value is used across the whole image. We took this value to be the mean of the AOT (or PWC) values measured across the area, and then examined the errors that would result from correcting a pixel with this mean AOT when it actually had a higher or lower AOT. We performed simulations taking this higher AOT to be the 95th percentile of the AOT distribution, and the lower AOT to be the 5th percentile of this distribution. This meant that the errors found from the simulations would be found in at least 10% of the pixels in an image covering the study area. MODIS: Two MODIS products were used, the MOD04 10km aerosol product and the MOD05 1km water vapour product. These were both acquired for tile h17v03 on the 16th and 17th June 2006, and are available to download through LADSWEB. AERONET: Measurements from the Chilbolton site were used – available here. GlobAerosol: Available via FTP from here. Met Office visibility: Available to UK academics through BADC. BIGF: Available to UK academics from BIGF.